I’m almost at the half way point! Apparently pregnancy lasts 40 weeks which is 10 months not 9. Where did the 9 months ever come from? The last week has been a major eye opener for me. Sean and I watched the documentary “The Business of Being Born” and and my idea of birthing has completely changed 180 degrees. I have never really thought too much about “options” when it comes to having a baby, I just figured you have contractions, go to the hospital, get put in a wheelchair, fill out some paperwork, get wheeled to your hospital room, hop onto the hospital bed, get an epidural, and push and scream until the kid pops out. I bet I’m in the majority thinking that’s the way it is done, I mean we all see it done like that on TV and in the movies. Well, after watching the documentary, reading some articles on the topic and speaking to some doulas over the phone, I have come to realize that is the way doctors and insurance companies want you to do it but not the best way of doing it for the mother or the baby. Once you get to the hospital, you are put on a schedule and if you don’t follow that schedule they start pumping you full of drugs to move you along. Those drugs put stress on the baby who is no longer on his natural schedule and all of a sudden a cesarean is needed because everything is out of whack. In addition because of insurance, in most hospitals mothers have to give birth in the hospital bed which is not the most natural way to give birth because it puts pressure on the pelvic region. Also if you think about it, it makes much more sense to deliver in a vertical position to let gravity do some of the work. Even in the case of an epidural, you are all of a sudden paralyzed from the waist down and can’t move around, and on top of that you can’t feel anything so you are more prone to tearing and other post birthing pain because you couldn’t feel anything to try and prevent it. I have gone from a birth plan of showing up at the hospital, getting an epidural and letting the nurses and doctor deliver my baby to wanting to deliver my baby with a midwife at home. Unfortunately I’m not sure that delivering at home is an option for me because of insurance (even though it costs $4000-6000 compared to $20,000 in the hospital). I found out about UCLA Westwood that has a staff of midwives and I plan to tour that facility and speak to them. All of the doulas I have spoken to said that the most pleasant and happy births they have attended were at that hospital with the midwives. The nice thing is that you do get peace of mind where if a doctor is needed for intervention they are close by as opposed to having to travel to the hospital quickly if something goes wrong. So my new plan is to work with a doula before, during and after the birth and have a midwife work with us during the birth. You might wonder why I want a doula. Neither Sean nor I have any family in LA and are both out of touch with how to care for a baby. I also want to work with someone on techniques like hypnotherapy and massage to be able to deliver naturally. A doula will help you prepare for the birth, be with you when the contractions start, take you to the hospital, stay with you through the whole birth and help you through it, help you start breastfeeding and then visit you at home to help with things like giving the first bath. 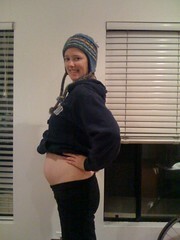 I have researched that people who work with doulas have a higher success rate of natural births than those that don’t. I have also spoken to friends, both men and women, who have worked with a doula and said that they couldn’t have done it without them. Today Sean and I interviewed our first doula and really like her. It turns out that she worked with Shepard and Amanda Fairey on both their births which was good news to Sean because they are good friends of his. We have plans to interview two more doulas but I already like the first one so I might just commit to her. I think one of the most important things is to click with your doula because she will be with you for one of the most important times in your life. As for BB, I posted a week ago that we felt the baby kicking or punching or headbutting us on the outside which was a total thrill. I didn’t think it would be so soon or where my stomach used to be…I thought it would be lower but I guess my stomach and intestines are squished towards the back now. When I feel it, it feels like a little “Pop!” Sometimes there are a bunch in a row or just one or two. BB is more active after I eat, they say that’s because the baby gets energy from the food and a good reminder that what you eat is affecting your kid. About the same time that we could feel the baby kick on the outside, Funston started to become very clingy. I thought it was my imagination but Sean has also noticed that the little dude doesn’t want to leave my side. I was wondering if this was going to happen a couple of posts ago and I guess he can just sense something even more now. I haven’t noticed a change in Lucky Cat except she still insists on stepping on my belly every time she tries to go from one side of me to the other. Owch! I had to break down and buy a couple pairs of maternity pants. I was actually quite upset about it but the Motherhood store had them for pretty cheap and I’m pretty desperate for a pair of jeans to wear now that it’s getting colder. I’ve had a hard time with bras because I already need some more, but they are expensive and I don’t want to have to keep buying them. The lady at Motherhood said to buy some without underwires but I’m not sure I’ll feel very supported. Sigh. This week the baby is the size of an heirloom tomato. Last week it was a bell pepper. I never really put the two veggies side by side to really compare the difference but I’m pretty sure the kid is a bit bigger this week then last week. Lastly I should mention that Sean and I plan on buying everything second hand. It seems that many baby items are used very few times and it seems more economical to not buy new. We plan on passing these items along to someone else (using Neighborgoods) when we are done. If you have any baby stuff for sale, we haven’t purchased a single thing yet. Thanks for reading. Until next week! Loving your update… So far out! Funny to hear about Funston. I wonder how he’ll react when BB pops out to say hi! Really diggin’ the updates, and glad to hear things are good. The Business of Being Born is pretty crazy, right? I watched that on Netflix a few months ago – it’s an eye opener for sure. Both my sister (2 years younger) and I were born at home with midwives. I was born in a van (yeah, really, on purpose), and my sister in an apartment. Both of us were fine, though in my case, my mom had a slight complication that required us to zip to the hospital – but all ended up being well in the end. Also, major props on buying second hand. Not enough people do that. I am basically a filthy hippie when it comes to natural pregnancy and birth so if you have any questions at all please let me know! haha good write. as a doula, I recently had a mom who was laboring great (took hypnobirthing), she felt kinda like pushing on way to hospital. So that when they arrived dad jumped out and said he was going to get wheelchair. What!? Oh no, no wheelchair! Mom is okay to walk. Walking is perfectly okay to do in labor, even late labor. It HELPS baby come down and usually mom feels better too. Baby’s do not fall out or so rarely that I’ve only have had one (in 200+) mom wheeled up to L&D but she was having her 4th baby. AND her urge to push was powerful not just a nice surging urge that mom could breath through. Happy Birth Day! 2 1/2 hours later mom breathed out – birthed her 8lb,8oz baby girl. Slow and easy does it! Your body is made to birth. Nice blog. Good idea on the doula, too. Having that extra person there who has done it a whole bunch of times and is focused on YOU as opposed to the baby (which is the midwife/doctor’s primary focus) really helps. They also help a lot with nervous daddies, I know my husband felt so much better having someone there who was kind of a friend (you already have this established relationship before things get going) to ask questions and he found it much easier to voice his concerns to her and get assurance as to whether those should be concerns or if he was over-reacting. loving the updates and how things are starting to change for you. More to come for sure. My sister inlaw is 15 weeks and having her first as well. It’s funny to hear her talk to Tiffany about things and TIffany just responds “yeah that’s going to happen” or “yeah that’s normal”. I like everything you have to say here and encourage you to go for a natural birth. My wife did it as planned and even though it’s a long story we both feel best about it going that way. Neither of us wanted her to be disconnected from the experience in any way. Hope things are continuing to go well!